We killed this! WE KILLED THIS! I remember reading somewhere ‘even if one person is left alive, a kill is still a kill’ and we had everyone left alive. Not. Apparently the mechanics are the same, he just hits harder. Well, they were kinda the same. Apart from the horrendous bug we encountered where Bladefist would switch targets mid beserker rush and half the raid would get eaten. I’ve always been a fan of standing near the pillars so I’m prepared for the rush but the boss moved quite quickly so our usual tactic of just looking up and seeing where a pillar was did not quite cut the mustard. We used world markers on them to call out where the pillars were and melee would have to move to an opposing colour to make sure they were out of the way. It wasn’t clean by any means. It took five wipes to get it down but each time we were getting closer. The only thing of real importance I said all night (apart from calling out mechanics) was to “make sure your nappy is strapped on guys!” Holy crap by the end of it we needed it! The last pull things were going ok. A few people had died but we were burning him down as best we could. Group one went up when they should do, they killed who they needed to. It then all unraveled slightly at the end. Blunnerz was the only healer with both tanks and the smattering of dps left alive. Nullflow is a demi-god for the rest of the night. It didn’t go unnoticed that we only had one player left alive at the time of the kill. Although, it may have been forgotten when Blunnerz noticed that is ring had dropped from the boss. We went to the Butcher after we stopped screaming. We had a pull issue. The Butcher seemed to be very very angry about something. Fenrir, who was on his pally, managed to pull him by just standing there. Cue a mad panic and everyone running around. As we tried to regain control we inevitably got slaughtered. Running back in I paused to eat, a ready check went up and with only ten seconds to go until I got my food buff I clicked yes but did warn I was still eating. “Why did you click ready if you’re still eating?” Blunnerz joked. Up went the pull timer. Many messages appeared in raid chat of ‘don’t go’ right at the end of the rather short pull timer but to no avail. We went. We did manage to scramble into position. And start the hokey-cokey phase. With the first bounding cleave we got scattered and also half the raid went down. I, somehow, managed to land on top of a pillar. I stayed there as my feign death had somehow been removed and was on cool down. I just hoped that the boss would think there was no one left and ignore me if I just didn’t hit him. As the last man standing I half breathed a sigh of relief as the boss was miles away just standing there. Then like a scene from Hellraiser, a hooked chain came flying out and dragged me towards the boss where he promptly smashed me with his mace and I dropped to the floor, quite dead. Danue was having an issue with her boss mods when we settled back in by the stairs. We sorted her out and someone asked how a pull timer was activated. We had already stated we were ready and Jolly put one up for five seconds. He charged at the boss and I shot it as Blunnerz and Rawls were both shouting not to go. At this point we decided to just switch to normal and take a five minute break. Needing to exit the arena to reset we tentatively walked outside. There were a couple of hordies waiting for their raid team to arrive. For which Marvv decided was an ideal time to kill things. I was just standing by the portal being targeted by hordies who were about to die. For the life of me I couldn’t see where they were before they disappeared. We then realised after Rawls had a nosey at what we were up to, that we had been ganking raiders from Exploding Lab Rats. Upon learning this we started pleading for people to get out of the raid so we could swap it to normal and get back in before the rest of the Lab Rats team showed up and handed our asses to us. Once we were almost all back in we got the trash down while the last few got back. We were a little bit slack in the actual boss. With Marvv and Nullflow managing to jump down from the stands in to a tiger pit. 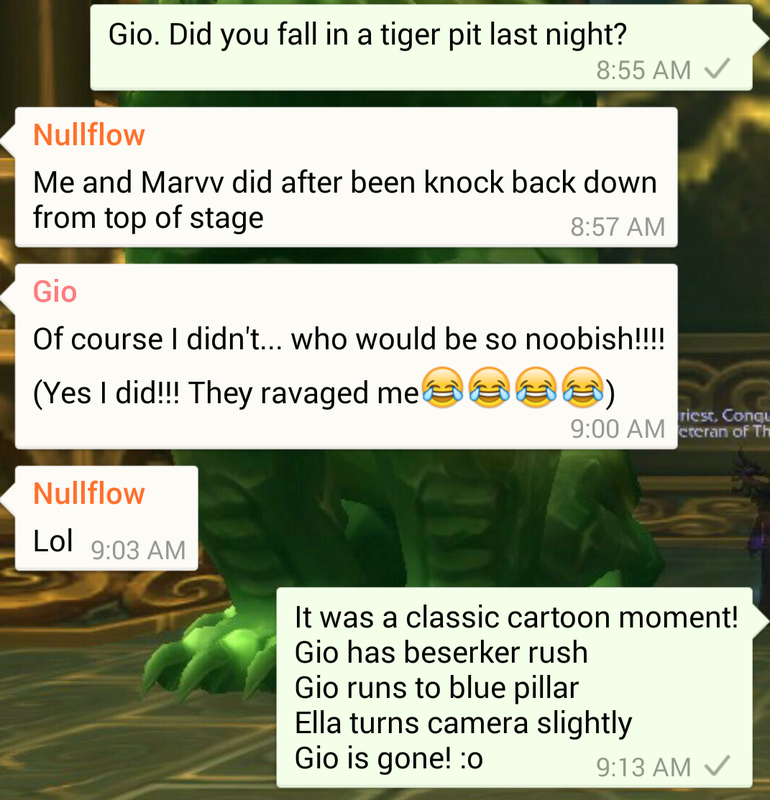 Gio also had a ‘hope no one saw that’ moment. I was positioned in between the blue and orange pillar and watched Gio run in front of me towards Blue. Beserker rush was ended and I paned my camera around slightly as I noticed Gio was almost dead. Gio was also nowhere to be seen. I thought about it for a moment and figured that he had just run away quite fast. My brain however wouldn’t let the matter rest.